No visit to Cambodia is complete without at least a quick glimpse of women performing the ancient art of Apsara dance, as depicted on the walls of Angkor’s temples. Wearing glittering silk tunics, sequinned tops (into which they are sewn before each performance to achieve the requisite tight fit) and elaborate golden headdresses, they execute their movements with great deftness and deliberation, knees bent in plié, heels touching the floor first at each step, coy smiles on their faces. Every position has its own particular symbolism – a finger pointing to the sky, for instance, indicates “today”, while standing sideways to the audience with the sole of the foot facing upwards represents flying. In the reign of Jayavarman VII there were over three thousand apsara dancers at court – the dances were performed exclusively for the king – and so prized was their skill that when the Thais sacked Angkor in the fifteenth century, they took a troupe of dancers back home with them. Historically, the art form was taught only at the royal court, but so few exponents survived the ravages of the Khmer Rouge that the genre was very nearly extinguished. Subsequently, when Princess Boppha Devi – who had been a principal dancer with the royal troupe – wished to revive it, she found it helpful to study temple panels to establish the movements. It was not until 1995, a full sixteen years after the fall of the Khmer Rouge, that Cambodians once again witnessed a public performance of apsara dance, at Angkor Wat. These days, the Royal University of Fine Arts in Phnom Penh takes much of the responsibility for training dancers, who are chosen not only for aptitude and youth (they start as young as 7), but for the flexibility and elegance of their hands. It takes six years for students to learn the 1500 intricate positions, and a further three to six years for them to attain the required level of artistic maturity. Also taught is the other principal Cambodian dance genre, tontay, in which the emphasis is on depicting folk tales and episodes from the Reamker. The Royal University of Fine Arts mounts performances of Apsara dance show on special occasions (such as the Khmer New Year or the king’s birthday) in front of Angkor Wat and sometimes in Phnom Penh. But more commonly, you’ll be able to watch both styles of Cambodian dance in the cultural performances put on by hotels and restaurants in Phnom Penh and Siem Reap. Several restaurants and hotels in Siem Reap present Apsara Dance Shows. Most shows include the four genre of traditional Khmer dance: Apsara Dance, Masked Dance, Shadow Theatre, and Folk Dance. These are abbreviated dances for tourists, and unfortunately there is usually little, or no explanation as to the origin and meaning of the dances. But they are still interesting and worthwhile to see. 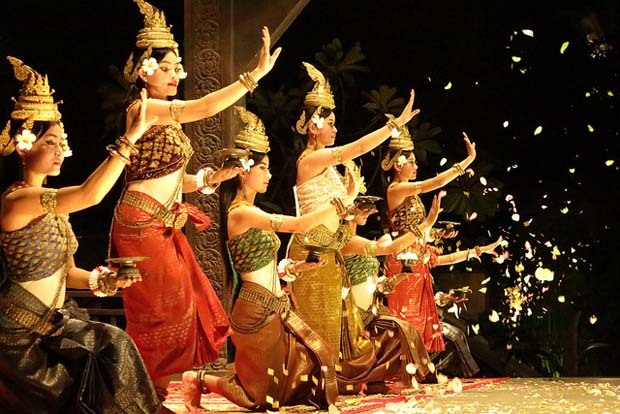 Below are a few of the venues offering Apsara Dance show in Siem Reap. Opening Hours: Wednesday, Friday, Sunday – Dinner 19:00 / Show 19:45. Opening Hours: Daily – Dinner 19:00 / Show 19:45. Note: Performances by children from the K.rousar Thmey NGO. The Sacred Dancers of Angkor is the first and only spiritual troupe of dance in Cambodia, which perpetuates the artistic tradition with passion and dedication. Under the Patronage of HRH Princess Buppha Devi lead figure of the Khmer Ballet and the Support of UNESCO, the dance and music conservatoire of NKFC, a non-profit organisation, taught them since 2007 the discipline in the ancestral khmer tradition: between meditation, praying and mastering the 4500 gestural, the silent language of the classical repertoires, 5 days/week, 6 hour/Day. These young musicians and dancers, born in the land of Angkor, in Banteay Srei temple, are now professionals. They have already met with real success, performing with acclaim abroad in USA, Japan and Laos! Come to discover and enjoy this artistic performance of the legends carved on the wall of Angkor coming to life, this is a way to promote these UNESCO treasures and at the same time contribute to the ethnic and local development.